USDCHF is under the influence of some economic reports such as KOF Leading Indicator (M/M) for CHF and Gas Storage, Chicago PMI, and Unemployment Claims in the US. Today USDCHF started with leaving a bullish candle followed by a pullback afterwards. 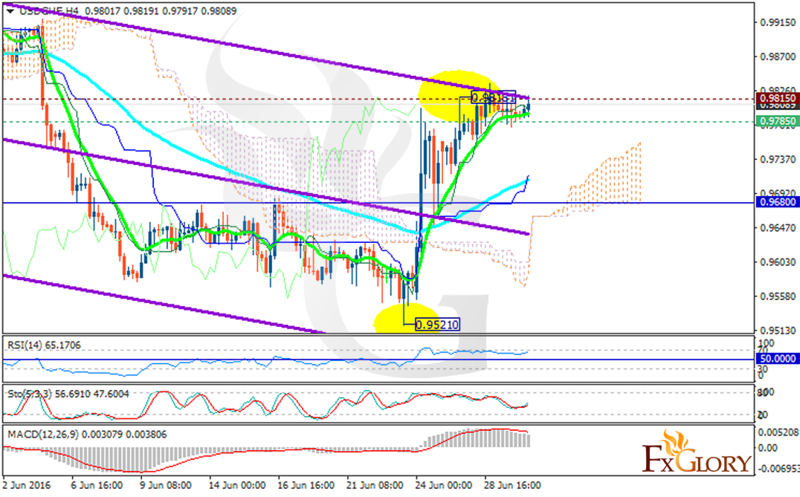 The support lies at 0.97850 with resistance at 0.98150 which both lines are above the monthly pivot point at 0.96800. The EMA of 10 is rising and it is located above the EMA of 75. The price is above the Ichimoku Cloud and it is below the Chinkou Span. The Tenkan-sen is showing downward trend and the Kijun-sen is showing upward movement. The RSI and the MACD indicators are in positive territory and the Stochastic is moving horizontally. The resistance level breakout will make the pair grow to 0.99.